Are you looking for a new business copier, printer, scanner, or multifunctional device? We can help! Copiers are not just copiers anymore. Sure you can still walk up and make a copy but today's digital copiers are truly MFPs, (multi-functional, peripherals). They can be connected to your network and function as a super high-speed printer with all the finishing capabilities that the walkup device offers, such as sorting, stapling and booklet making. Today's digital MFP can digitize your documents with their scanning ability, astronomically reducing storage requirements and greatly increasing security and data safety. Copier Resources can help you learn about the various copiers, printers, scanners, or multifunctional devices on the market and, more importantly, find the system that best suits your needs and budget. You can check out our FAQs page, which will quickly answer some of the more frequent questions. You can also read expert advice about copier features, pricing, leases, software, and more. You can also search CopierResources.uCan.us or the entire web from right here. Once you get all the info you need, we can help you find dealers who offer the products you want – absolutely free. Just submit a free request for quote and dealers will contact you! 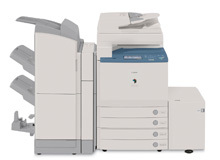 We give advice and information on copiers, printers, MFP, and scanners at Copier Resources. This information is vendor-neutral and completely free for you. We welcome your suggestions, questions and comments. We hope we can help you with your search for the perfect office copy machine! We can tell you how much you can expect to pay, whether you're buying or leasing your copier, printer, scanner, or MFP. Do you need an ADF, ARDF, DADF? A finisher? Do you need color, and if so do you need business color or graphic color. Speed and volume are everything in copiers - how do you decide what you need? We can help. One of the best things you can do when buying a copier is to do your home work. It is good to have a list of questions you ask every salesperson or dealer who tries to sell you a copier or printer. Know what software cost are. What are you out-sourcing costs? Here's some questions you might want to ask the dealers you are considering. Why should buy a copier/printer from you? How long has your dealership been in business? What's your best selling copier? Why? What are the most important features I should look for? What kind of service agreements do you offer? How many technicians do you have available? What is the tenure of your service technicians? Can you provide references to other customers?